UC Merced Professor Marcos Garcia-Ojeda and lecturer Kamal Dulai have received Macmillan Travel Awards to learn how to bring more effective teaching into the STEM classroom. 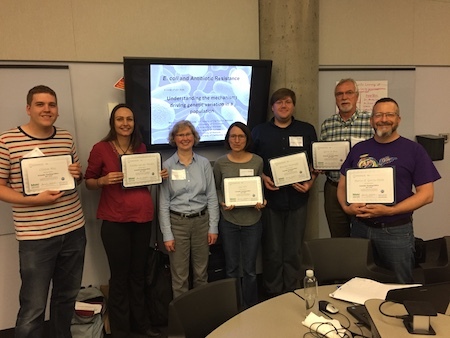 The $500 awards cover lodging and travel to one of the Summer Institutes on Scientific Teaching’s multi-day regional teaching workshops. Garcia-Ojeda attended the Northstar Summer Institute of Scientific Teaching at the University of Minnesota. Dulai attended the Northwest Summer institute at the University of Oregon. Both institutes were funded by the Howard Hughes Medical Institute. The Summer Institute is designed to train university professors from around the country in the principles of scientific teaching by implementing the same principles and pedagogy that scientists use in their research. Participants work with peers from other colleges and universities under the mentorship of a trained facilitator. They develop and test instructional materials based on the best practices found in the scientific and pedagogical literature. This includes designing and adapting instructional materials with clearly defined learning goals and bringing active learning, assessment and inclusive teaching into the classroom. “The institute provided me the tools needed to help not only my students, but also my fellow faculty members, many of whom had little pedagogical training before coming to UC Merced,” Garcia-Ojeda said. Both Garcia-Ojeda and Dulai are biologists with an interest in improving the learning outcomes of UC Merced undergraduates interested in the biological sciences. As the number of biology students on campus surpasses 1,500, both faculty members are engaged in designing courses that meet student needs, especially at the upper-division level. They are also committed to addressing the unique educational needs of UC Merced’s large population of first-generation and underserved students.